Our website is still in the process of being developed — please have a look at what we’ve done so far; more will be coming soon! In the meantime, contact us (Mick & Lynn Oakey) via e-mail at iret@btinternet.com or telephone and leave a message on 07854 840004. 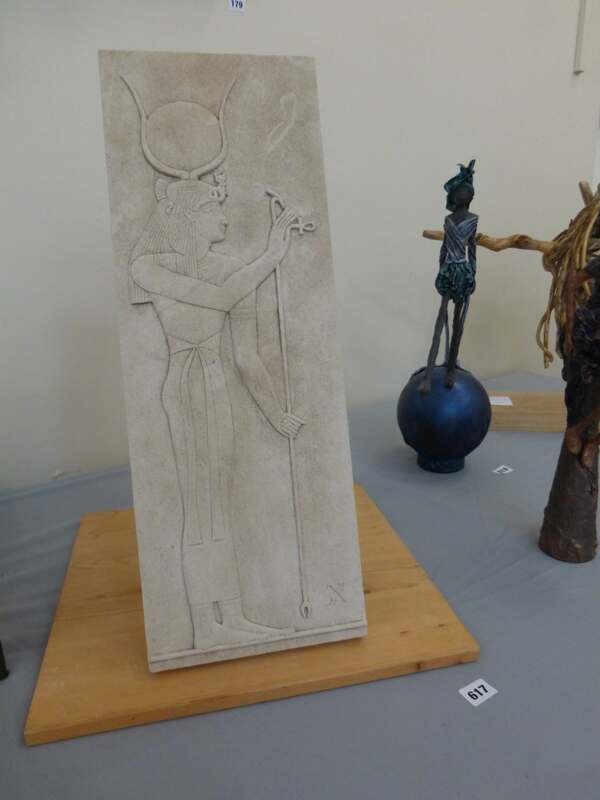 IRET NEWSFLASH, August 16, 2018: Three of Mick’s stonecarvings are on show (and for sale) at this year’s Association of Sussex Artists Annual Exhibition in the Drill Hall, Denne Road, Horsham RH12 1JF from Friday August 17 until Saturday August 25 — see images below. For more details, visit http://www.associationofsussexartists.co.uk/. 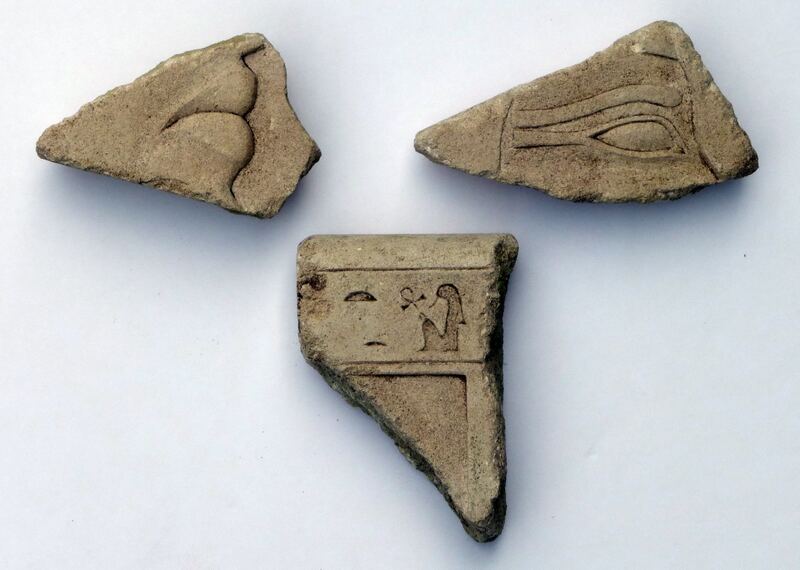 Fragment of Antiquity: Pharaoh’s Faithful Servants. Limestone, patinated, £160. Osiris Stela; patinated limestone, £120. 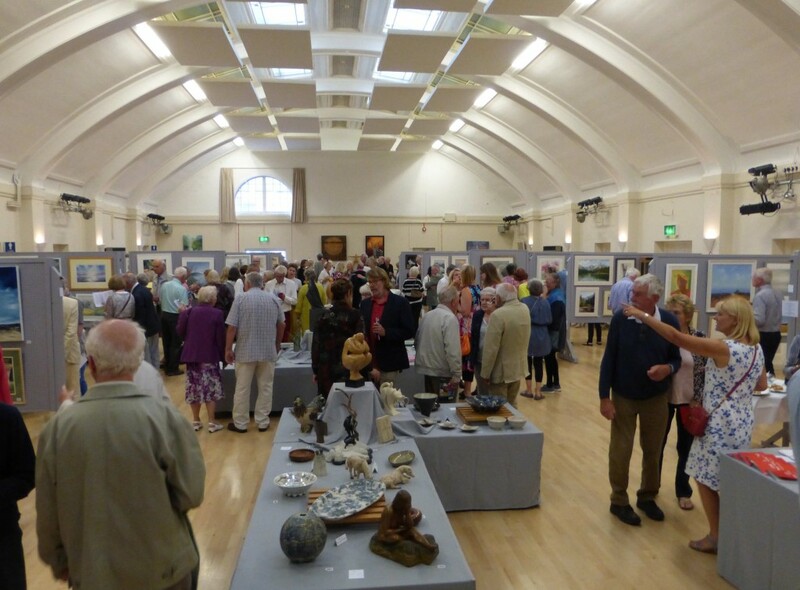 IRET NEWSFLASH, August 20, 2017: The trio of stonecarvings that Mick submitted for this year’s Association of Sussex Artists Annual Exhibition in Horsham all got selected, and are on show in the Drill Hall, Denne Road, until Saturday August 26 — see images below. 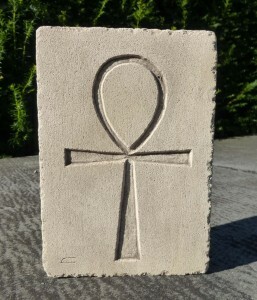 For more details, visit http://www.associationofsussexartists.co.uk/. 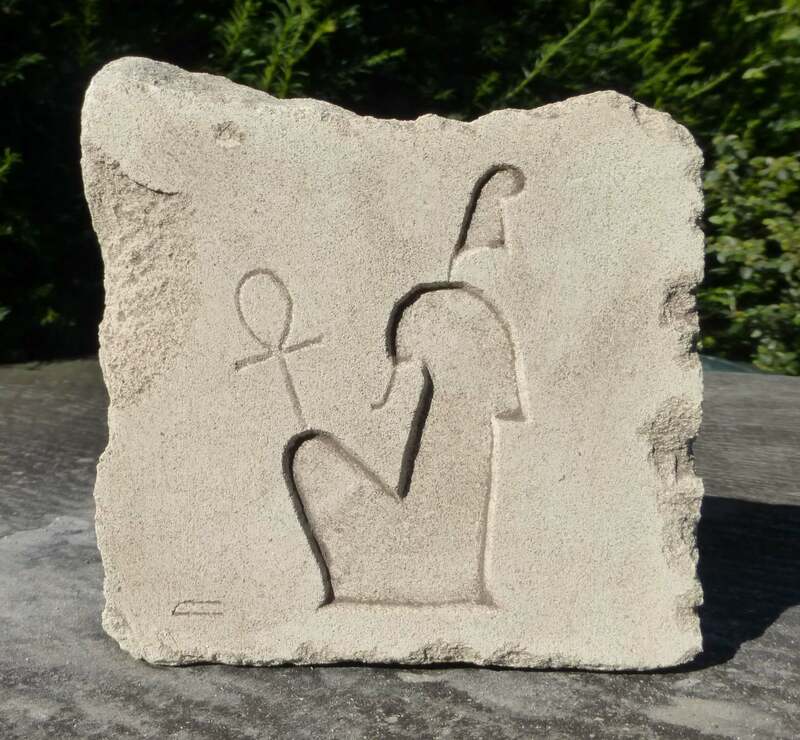 The Ankh sold at the Private View on August 18, but Ma’at was still available at time of writing for £25, and the big Hathor carving for £495. IRET NEWSFLASH, December 11, 2016: We were at Bloomsbury Summer School’s study-day at UCL in London yesterday, presented by the great John Romer. 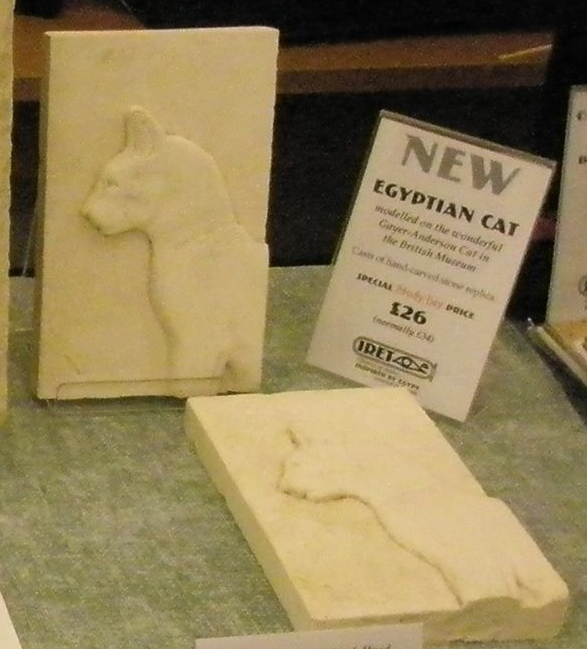 We sold lots of jewellery and Egyptological Christmas-cards, and casts of our newest pharaonic-cat stonecarving — seen in the pic BELOW taken by Gwyn Ashworth-Pratt — sold like hot, er, cakes! If you’d like one, e-mail us; they were inspired by the famous Gayer-Anderson Cat in the British Museum. 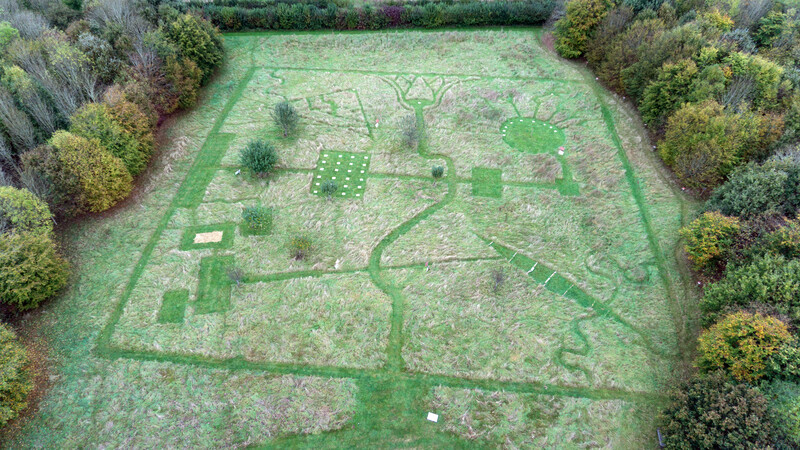 IRET NEWSFLASH, September 26, 2016: Somewhat off-topic as it’s not actually part of Iret, but Mick was awarded a prize today at the British Museum for his “Fields of Eternity” Egyptian-themed grass-maze/meadow-garden, which he designed and helped create at Chiddingstone Castle in Kent. The garden (seen in an aerial view BELOW) occupies an acre of ground beyond the Castle’s North Lawn, and mainly comprises mown paths in rough grass. 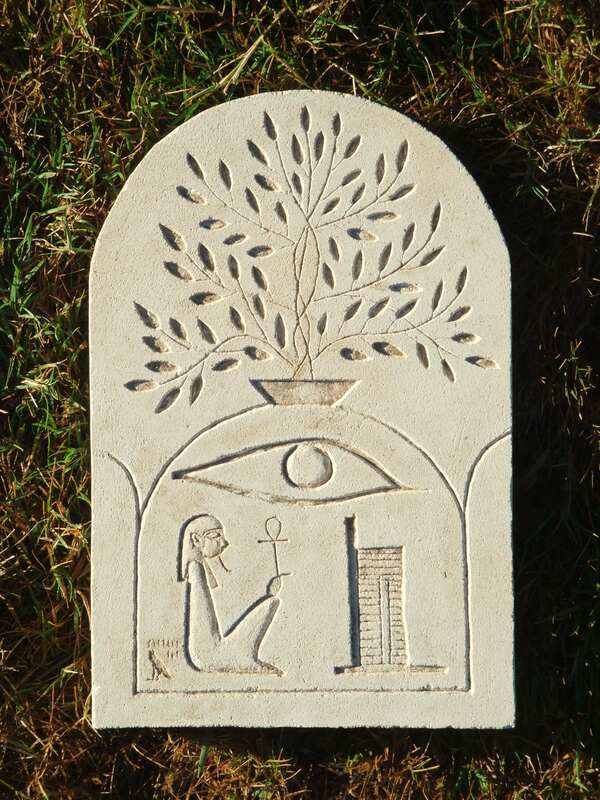 Elements are arranged around a representation of the Nile (running south—north) and culminating in the Delta, stylised into a lily flower; and a temple axis (running west—east), with several “chambers” including a hypostyle, in which paving slabs represent column bases (upon which visitors may stand to represent the columns). The quadrants created by the two axes are filled with (clockwise from lower left): a 1:1 scale plan of Tutankhamun’s tomb, on the same compass orientation as the original (and with a sandpit plan of the sarcophagus, in which cement shabtis, scarabs etc are buried for youngsters to excavate); a cross-section of the Pyramid of Khufu; a circular “Sun Court”, the Amarna-style handed rays of which work in conjunction with a central post as a giant sundial; and a half-scale plan of Khufu’s (first) funerary boat. There are also narrow squiggly “robbers’ tunnels” acting as shortcuts between different parts of the site; these are especially exciting for youngsters in summer, when the surrounding grass can be higher than their eye level. The garden was conceived as a teaching-aid to complement the Castle’s Egyptian collection, and as a source of fun and interest for all. Mick won the South-East Region category of the 2015 Marsh Trust “Volunteers for Museum Learning” Awards. 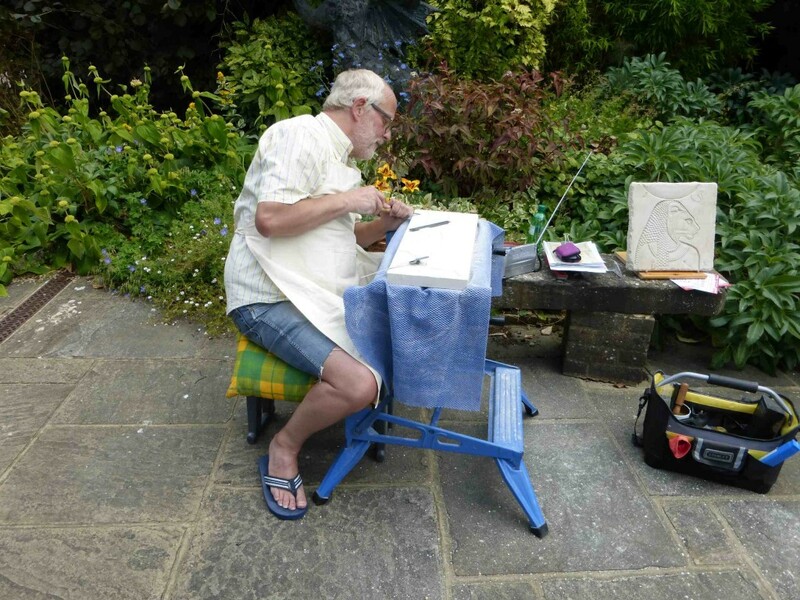 IRET NEWSFLASH, July 16, 2016: Mick is at Horsham Museum today, demonstrating stonecarving alongside fellow sculptors, potters and painters from the Association of Sussex Artists. It’s part of Horsham Festival, a new arts festival in the district. 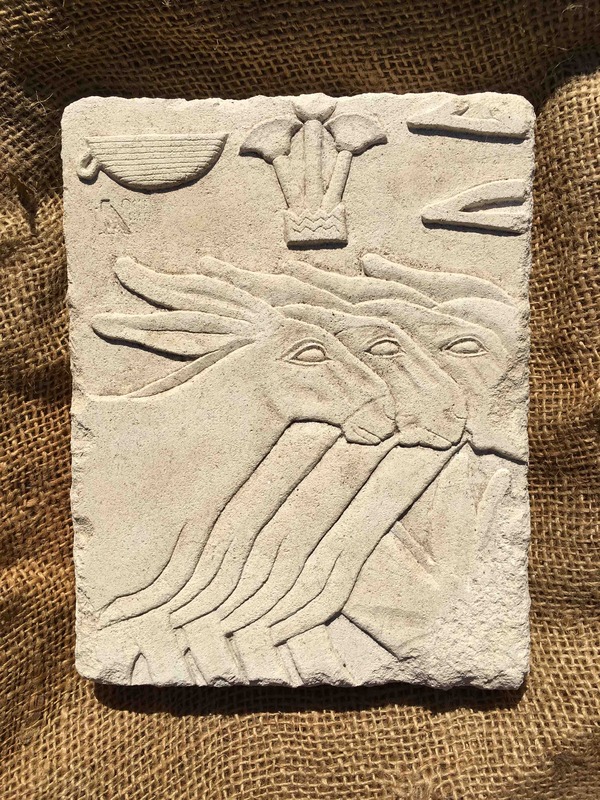 IRET NEWSFLASH, September 23, 2015: An enlarged selection of our products, including jewellery as well as stonecarvings and Christmas cards, is in the Pop Up Horsham shop (Unit 60, Swan Walk, Horsham, West Sussex RH12 1PT) from September 28 to November 1 — come and see us, and chat/browse/buy! IRET NEWSFLASH, August 30, 2015: Our products are in the Pop Up Horsham shop (Unit 60, Swan Walk, Horsham, West Sussex RH12 1PT) for the coming month — come and have a browse! IRET NEWSFLASH, July 31, 2015: Mick is taking Iret’s pop-up mini-souk to Bloomsbury Summer School again today — many thanks to the school’s Co-Director Lucia Gahlin for the invitation. Come and browse, chat and buy in University College London’s History Dept common-room today between 1300 and 1400hr. 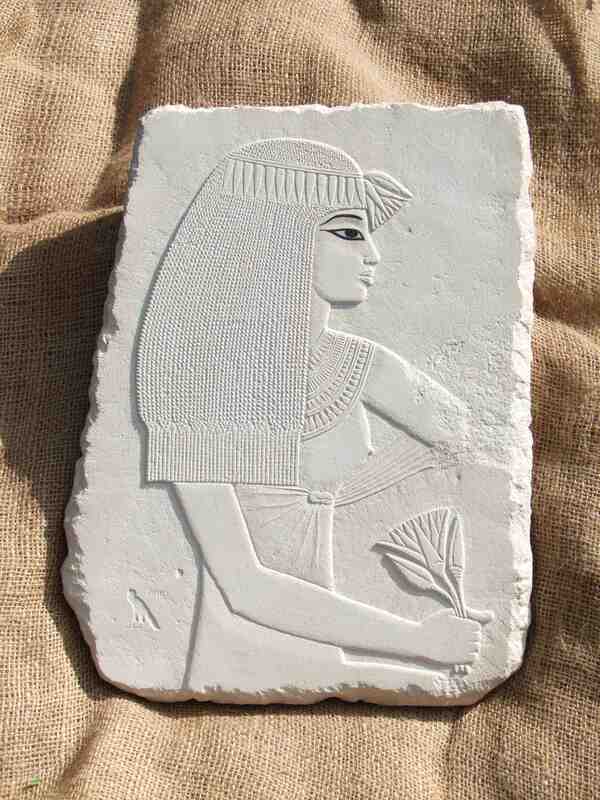 For more details about the summer-school see www.egyptology-uk.com/bloomsbury. 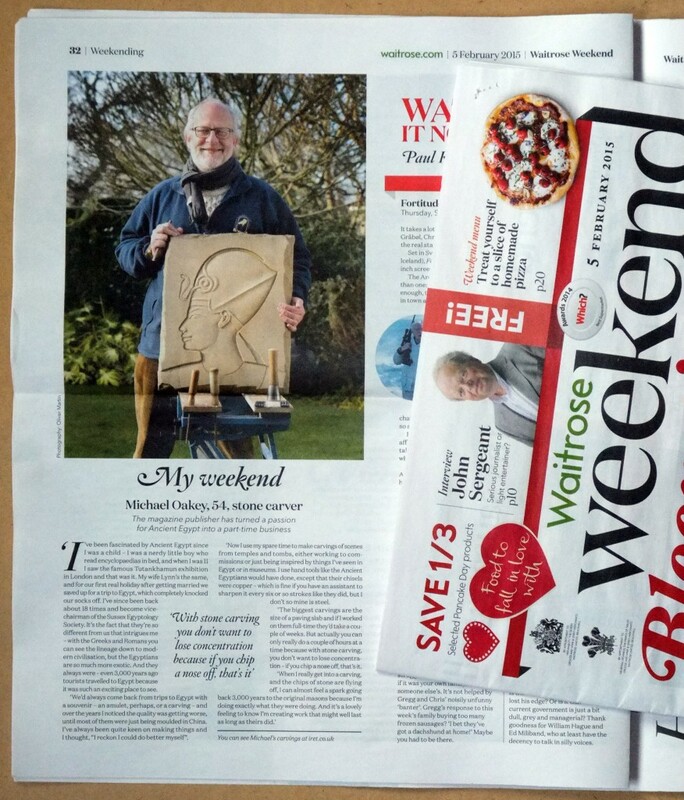 IRET NEWSFLASH, February 5, 2015: Mick’s stonecarving activities are featured in Waitrose Weekend, the upmarket UK supermarket’s mass-circulation free weekly newspaper! See the article below — and don’t forget to look at our (mainly) weekday business too: www.theaviationhistorian.com. 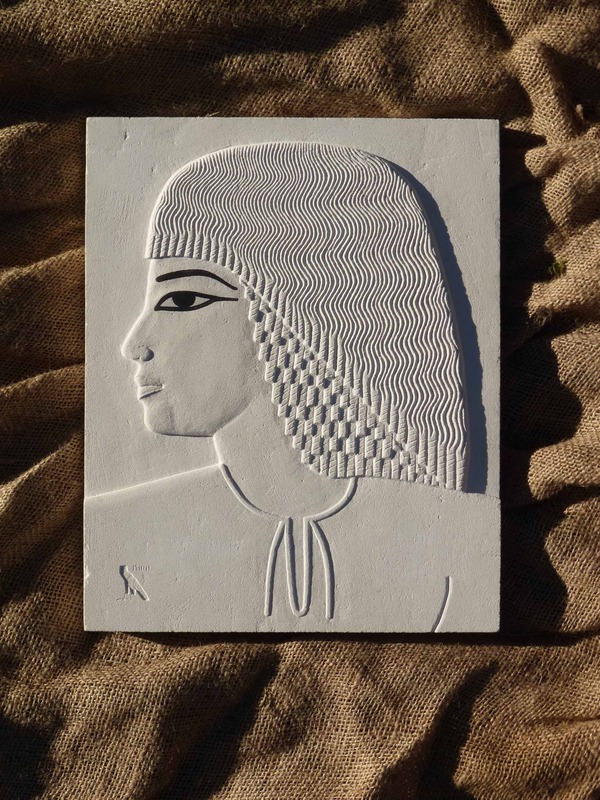 The article shows Mick in his favoured location for stonecarving — outdoors — with a favourite piece, pharaoh Thutmose IV wearing a “khepresh” battle-crown. The portrait photograph is by Oliver Martin/www.olivermartin.co.uk. Just look at the detail on that lavish New Kingdom wig. 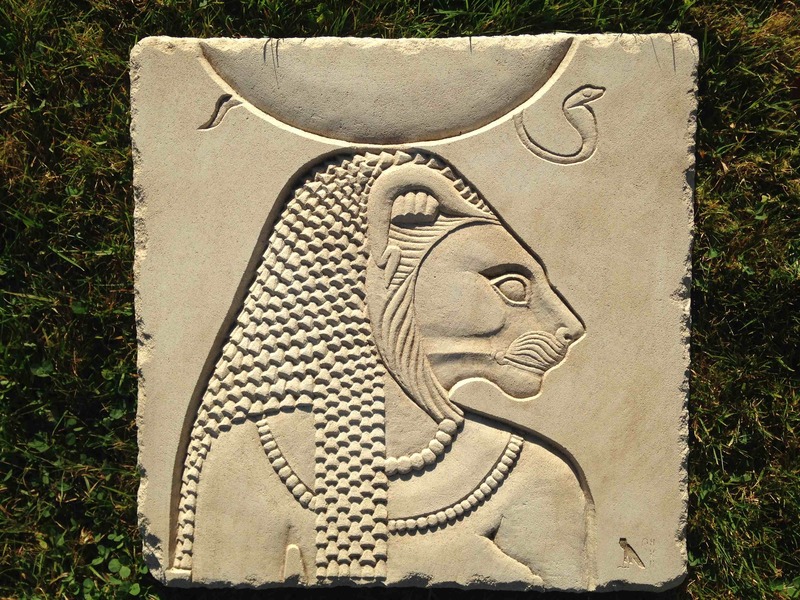 Very difficult and time-consuming to carve, but the result is well worth the effort. 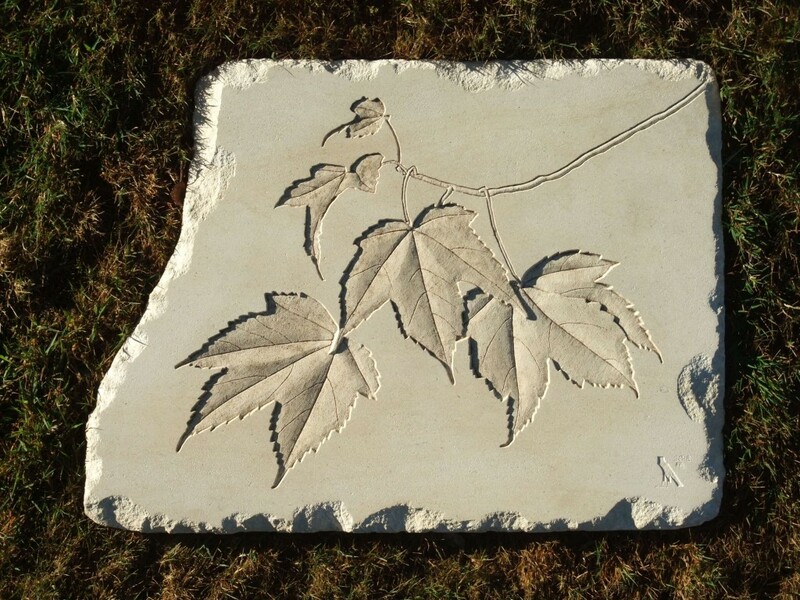 IRET NEWSFLASH, August 14, 2014: Four of Mick’s stonecarvings are on display at the 102nd Exhibition of the Association of Sussex Artists, in Horsham, during August 14–23. See his Facebook page (Aug 14) for pictures and more info. IRET NEWSFLASH, April 17, 2014: We are at Horsham’s Piazza Italia weekend on Easter Saturday 19th, as part of Daisy White’s Booktique in the Horsham Story Theatre tent on The Forum (opposite Sainsbury’s). 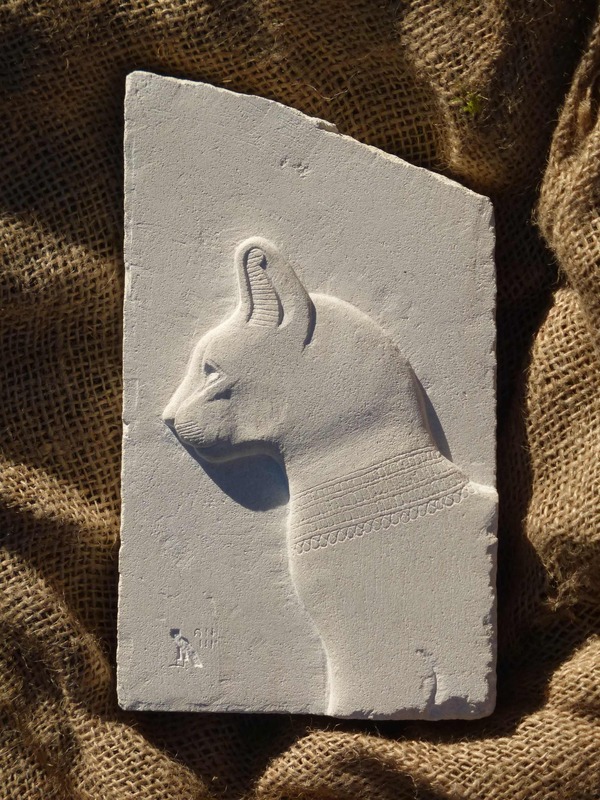 Come and say hello and see some of our latest jewellery and stonecarvings! IRET NEWSFLASH, September 27, 2013: Our jewellery, cards and casts are on sale at the Pop-Up Indie Bookshop in Horsham town centre during the weekend of September 27–29. We’re right opposite Marks & Spencer in the main Swan Walk shopping centre. 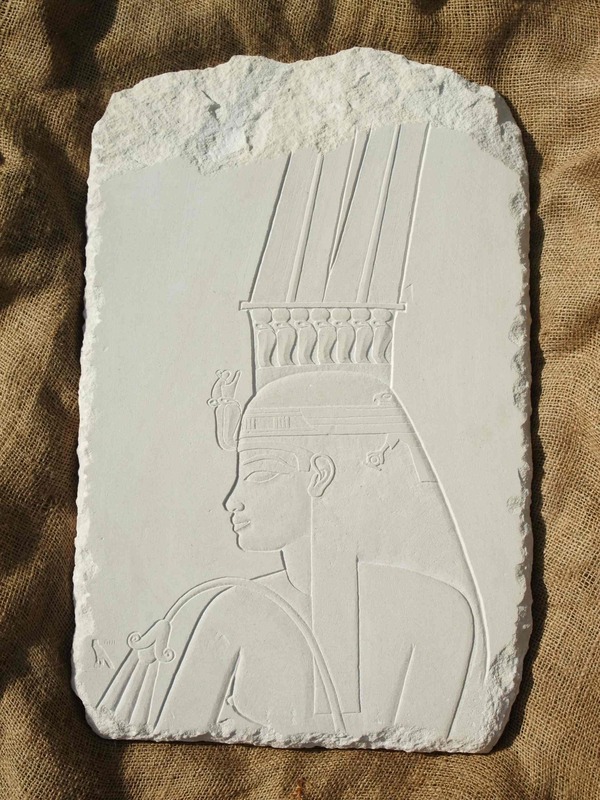 IRET NEWSFLASH, January 20, 2013: Details of Mick’s biggest stonecarving to date, a 25kg head of Thutmose IV, have just been added to our Stone Replicas page. This is the carving which was voted joint-first “Most Popular Sculpture” at the Association of Sussex Artists Exhibition last summer.